Personal Protective Equipment (PPE) is important when collecting urine and oral fluid (saliva) test specimens. 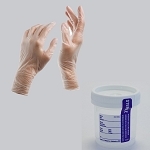 Our Personal Protective Equipment kit includes a pair of latex-free vinyl gloves (large size), and a specimen cup. The specimen cup can hold up to 90ml of fluid, comes with a temperature strip and comes sealed and sterile. 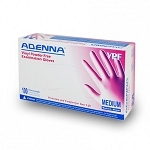 Each box of gloves contains 100 synthetic vinyl gloves that are powder free and available in four sizes: Small, Medium, Large and X-Large.